Many London creatives are changing their working habits. The economic crisis has spurred a need for alternatives, as many become self-employed or start up their own business to create job opportunities for themselves and others. But it’s not just about how they work that is changing but where. Working from home seems last season in the creative London community. Many find themselves gravitating towards other like-minded to share the joys that the long hours of a self-employed or startup business can be. 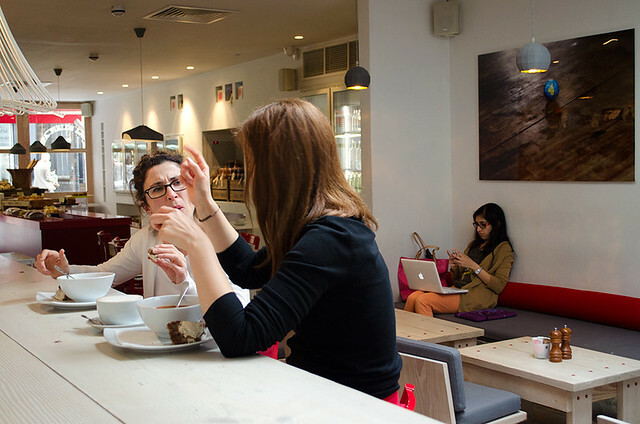 Some take to the many trendy cafés for free Wi-Fi and the surrounding buzz. Others work from one of the many co-working spaces in the capital. Gail’s bakery is one of the many cafes in Islington visited by self-employed and other people who do not work in an office. It is bright, spacious, and it offers free Wi-Fi to its customers. Read on about this in my and Maria Martinez Ugartechea’s article, where we explore alternative working environments in London for St John Street News.